Jones Bros provides Muck Boots to farming and agriculture operations and outdoorsmen and women throughout Missouri. 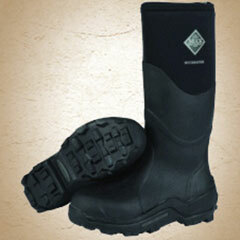 Both Muckmaster and Woody Max rubber boot series are available in a range of sizes. The Muckmaster series is a great boot for everyday chores and farming. The boot offers a 2mm layer of thermal foam under the foot bed for advanced comfort and stability. The boots comfort ranges from -20°F to 50°F and features lugged soles for slip resistance and grip. 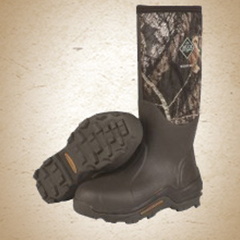 The Muckmaster Muck Boot is available in high (17 inches) and mud-cut (13 inches). The Woody Max series from Muck Boots is a great boot for hunting. Available in camo, the boot keeps hunters warm and comfortable with a 5mm neoprene-fleece liner and 2mm thermal foam under the foot.